Visiting scholar at The George Washington University’s Elliott School of International Affairs and former ambassador of Guatemala to the United States, the United Nations in Geneva and New York, the Organization of American States, Canada, Germany and Norway. Last week, representatives of 34 countries met in Washington, D.C., to discuss the political crisis convulsing Venezuela and to debate whether the countries of the Americas might play a role in resolving it. The June 23 meeting at the Organization of American States (OAS) was the first time the OAS had put this type of spotlight on a single country since 2009, when Honduras’s president was ousted in a coup-d'état. Venezuela has been thrown into a political, economic and social tailspin, thanks to the gross mismanagement and corruption of President Nicolas Maduro and his government. The country is wracked by food shortages, a collapsed health system, social unrest and political repression. The International Crisis Group has urged the government to declare a humanitarian emergency and permit the delivery and distribution of food and medical aid by nongovernmental agencies. As the handpicked successor of the late Hugo Chavez, who died in 2013, Maduro has tried to advance the same populist agenda but without the benefit of his mentor’s charisma or the high oil prices that allowed Chavez to fund domestic social programs and win international allies. The political and social deterioration resulting from Maduro’s ineptitude has led to a breakdown of democratic order and the rule of law. The meeting last week was convened by OAS Secretary General Luis Almagro under the terms of the Inter-American Democratic Charter, a 2001 accord aimed at strengthening and upholding democratic institutions. It allows the OAS secretary general to call for a meeting of the organization’s Permanent Council in cases of an "alteration of the constitutional regime that seriously impairs the democratic order in a member state." Venezuela’s foreign minister, Delsy Rodríguez, vigorously protested the meeting, calling Almagro a “pseudo-Fascist” acting on behalf of “imperialist interests.” She was overruled by a 20 to 12 vote that allowed the meeting to proceed. Almagro presented a scathing report on the rapidly deteriorating conditions in Venezuela. Despite having the largest oil reserves in the Western Hemisphere, the country now has more than three quarters of its population living in poverty. The Bolivar has lost 99% of its value since 2013, and inflation is soaring at 720%. Water and electricity outages are daily occurrences, and the lack of medicines, supplies and equipment has forced hospitals to close. Food shipments are protected by armed guards, and violence and looting are rampant. The new National Assembly, elected last December, has introduced legislation to allow international humanitarian aid into the country and to free political prisoners, including the Harvard-educated opposition leader Leopoldo López, who is serving a 14-year jail sentence for inciting civil unrest. However, the Supreme Court—stacked with Maduro appointees—has blocked these and other new laws. A presidential recall referendum has been repeatedly delayed by the pro-Maduro Electoral Council, despite its sponsors’ collecting 1.8 million signatures. Almagro argued that OAS member states should take collective action to resolve the humanitarian crisis and to pressure Venezuela to get “back on the path to democracy.” He called on Venezuela to immediately release all political prisoners, to hold the recall election before the end of year, and to restore respect for the separation of powers. Almagro and all OAS member countries agree that a dialogue between the Venezuelan government and the opposition is badly needed. The former presidents of Spain, the Dominican Republic and Panama have been trying to get such a dialogue going but have been unable so far to get beyond "exploratory talks." One of Almagro’s recommendations is for the OAS to support and advise the former presidents on how to bring Venezuela’s two sides together face to face. The Inter-American Democratic Charter should also play a role. It sets out measures that can be applied in cases where countries have restricted civil and political rights and democratic rule has been seriously eroded. 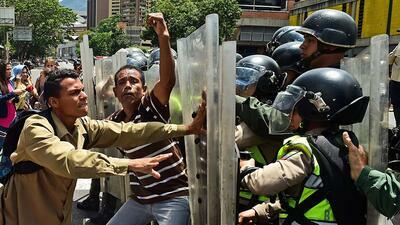 Without this kind of pressure it will be very difficult to get the Venezuelan government to step back from the brink. Predictably, Maduro and his supporters argue that such international pressure infringes on Venezuela’s sovereignty. But that argument does not stand up to contemporary concepts of human rights, including civil and political rights. As Almagro told ambassadors at the OAS, “democracy has no borders.” Today, states must answer to the international community for their treatment of individuals. Other countries of the Americas have a responsibility to help the people of Venezuela take back their country and start down a new path to peace, security and prosperity.